This one was there to be had. While Louisville held the lead for the majority of the second half, it never ballooned to far enough away from Indiana until the bitter end when some lackadaisical passing sealed this one for good. But as the second half minutes ticked, Louisville simply kept pace just ahead of the Hoosiers, as IU missed 3-pointer … after 3-pointer … after 3-pointer. Indiana failed to connect on any of its 12 shots from distance over the final 20 minutes of the contest and shot just 10-of-28 overall. It simply just couldn’t muster enough offense — and all it needed was just a little more offense — to pull off the upset inside the KFC Yum! Center this afternoon. A disappointing game from Robert Johnson. In 35 minutes of play, the senior didn’t score as he missed all four of his 3-point attempts and all six of his shots from the field. While Josh Newkirk hit some timely shots and fed his teammates well at times (four assists), he finished just 2-of-8 from distance and only 4-of-12 overall. Al Durham Jr. missed all three of his field goal attempts. Did Louisville’s length and defensive activity bother Indiana at times? Sure. Could the ball movement have been better in the second half? Absolutely. Regardless: There’s more to the story here and we’ve seen it creep up at other times this season. 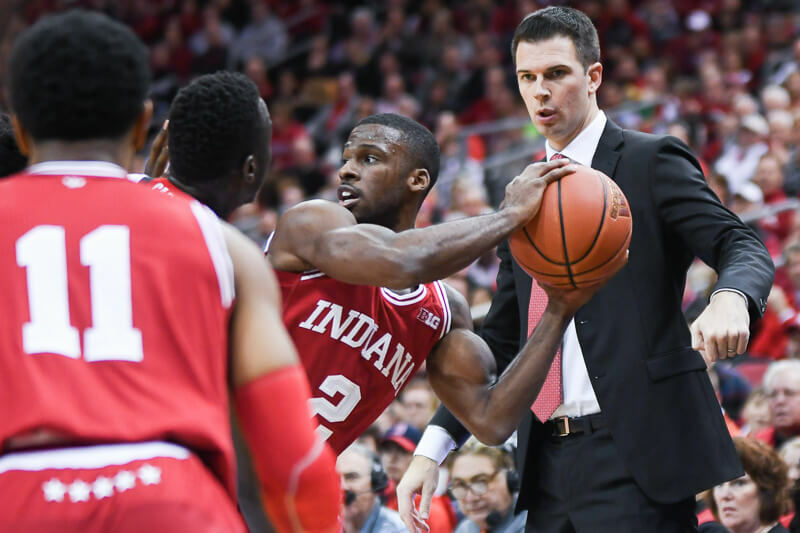 In the first year of the Archie Miller era, Indiana is really missing the likes of a Yogi Ferrell or James Blackmon Jr. — a guard you can, more often that not, count on to get buckets. Instead, this offense is best suited playing inside-out, with De’Ron Davis and Juwan Morgan getting touches in the post, and either going it alone to the basket or finding shooters on kickouts when the defense collapses. Indiana’s offense started well enough, entering the locker room scoring 1.13 points per possession thanks to a 5-of-11 mark from long range and some nice offensive rebounding turning into second-chance points. But after it sputtered out in the second half, the Hoosiers only mustered .92 PPP for the contest. Indiana also didn’t help themselves with a turnover percentage of 22, which the Cardinals turned into 17 points. Davis kicked his free throw shooting woes this afternoon, hitting 4-of-6 including 3-of-4 late to keep things interesting. He scored 14 points in 23 minutes of action while also snagging seven boards and blocking three shots. The sophomore proved he could more than hold his own against the likes of Anas Mahmoud and Ray Spalding. Juwan Morgan continues to shine and through 10 games there’s little debate he’s been Indiana’s best player. He scored a game-high 17 points (7-of-12) to go along with nine rebounds. Zach McRoberts played a solid 15 minutes in very Zach McRoberts fashion, making the hustle plays en route to a modest box score line of two points, two rebounds and an assist. Indiana wasn’t favored to win this game. But a touch more offense could have set the Hoosiers up for victory down the stretch. Instead they’ll enter next weekend against a strong Notre Dame squad fighting to stay above .500, this brutal five game stretch almost in the rear view mirror. I watched the game again last night (rewinding, taking several looks at plays) and it simply isn’t true that Rob is playing head and shoulders the best defense on this team. Several mental breakdowns and I’ll point out a couple that really stood out. The first, he was guarding Deng Adel on the right wing, he takes Rob off the dribble (going left) and gets into the middle of the lane, Rob makes a decent recovery but instantly bites on a pump fake and has to foul to prevent the bucket. The second, Rob’s man is in the weak side (right) corner, the ball is driven from the opposite wing/corner area and Rob way over helps, Al was already in solid help side and could have recovered to his man at the top of the key/right wing area. The next pass gets kicked to the right wing/top of the key area (Al’s man), Rob has completely lost track of his man in the corner thinks his man is at the top of the key/right wing area and now we have both Al and Rob closing out on the guy the top of the key. Can you guess what happens next? The ball is moved to Adel in the corner and he hits a wide open 3. Mistakes are made, I get that. But if you can’t add anything on the offensive end you need to play nearly perfect defense. Rob is not, which several on here just refuse to see. Up to now, Newkirk, Green and Al are all bringing more to the table IMO. I’d like to see a lineup of Juwan, De’ron, Collin, Devonte and Al on the court together for several minutes at a time. Devonte Green is the only guard that can consistently get the bigs the ball in their sweet spot. I seen a comment saying something of this nature: Green came in and took a wild shot and gave up a wide open 3 point attempt in his first 30 seconds. Wild? It probably wasn’t a great look, but he drove the lane and took a layup over length. We had rebounding opportunities on the weak side and didn’t come up with it. He’s at least putting pressure on the D. Have to try to get in the lane and make things happen. Now don’t get me wrong he needs to pick and choose his spots. He gave up a wide open 3? He helped out on a guy driving from the top of the key and then gave a pretty decent close out and the 3 went down. He might have over helped a little which he needs to work on. Now the very next play down the court Rob drives and gets called for a charge. How is Devonte’s play on the previous trip wild and out of control, but yet Rob, who plays so smart and tough is whistled for a charge the next time down and we make no mention of that?